Our delightful range of painted and mango sideboards is made from 100% solid hardwood. Style for your dining room! Our painted and mango sideboards are a delightful addition to your living room, dining room, and more. Made from only 100% real hardwood, they offer plentiful storage and great versatility. Featuring a great mix of storage facilities; from drawers, to cupboards, to the beautiful solid oak top to display, our sideboards will provide you plenty of space to store all manner of belongings. The drawers all feature solid hardwood bases backs and runners. We never use veneers, MDF, or other inferior materials in our painted and mango sideboards. They also have dovetail joints for strength and durability over time. 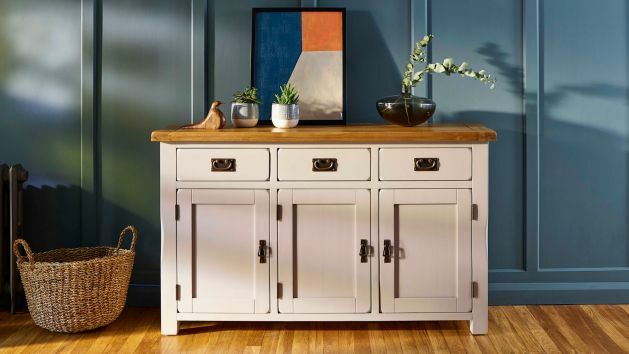 Browse our wide ranges of painted and mango sideboards, which coordinate beautifully with our stunning furniture collections. You're sure to find the perfect look for your home.